Commissioner Comer hosted a presentation about Homegrown By Heroes for Col. James P. Isenhower III, director of the Chairman’s Office of Reintegration for the U.S. Joint Chiefs of Staff, and Cmdr. Brent J. Embry, USN, Northern Region director of the Chairman’s Office of Reintegration. They were joined by state Rep. Kenny Imes, R-Murray, a member of the House Committee on Veterans, Military Affairs, and Public Safety; Heather French Henry, commissioner of the Kentucky Department of Veterans Affairs; and Homegrown By Heroes producers Alvina Maynard of Richmond and Danny Townsend of Jeffersonville, Ky.
Commissioner Comer said the unemployment rate of veterans and reservists in Kentucky is higher than the statewide average. 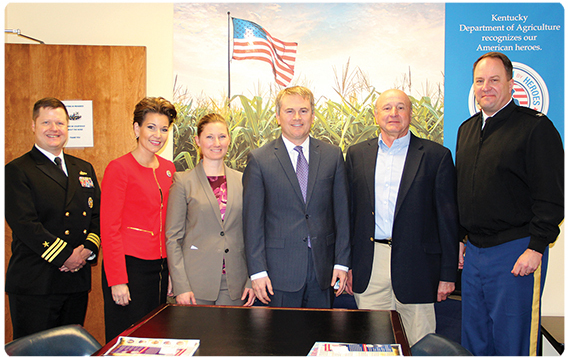 Comer said he and his senior staff conceived of Homegrown By Heroes as a way to use the popularity of the Kentucky Proud farm marketing program to help Kentucky veterans make a living in agriculture. More than 80 veteran/farmers are enrolled in Homegrown By Heroes in Kentucky, Commissioner Comer said. Over a Kentucky Proud lunch from Wallace Station in Midway, Maynard and Townsend chatted with the guests from the Pentagon about their businesses and products. Maynard operates River Hill Ranch, which raises Suri alpacas, and Townsend owns Townsend Sorghum Mill, a fifth-generation family farm that produces sorghum and vegetables. Homegrown By Heroes is a brand that designates agricultural products produced or manufactured by Kentucky military veterans. Commissioner Comer launched the program in January 2013, and the brand went national on Veterans Day 2013. Homegrown By Heroes is administered on the national level by the Farmer Veteran Coalition of Davis, Calif.
For more information about Homegrown By Heroes, go to www.kyproud.com/veterans.